During one of her many excursions exploring the palace, Cara Truman discovers a vast underground chamber that turns out to be the perfect place for her next invention. Soon, her dream of building the ultimate playground for the dragonlings is a reality.When Abby laughingly mentions the new playground looks like the perfect place to have a Halloween party, Cara goes into high gear to create the perfect haunted house adventure for the babies. The fun kicks into high gear when the men discover what Cara has been up to and decide to "test" the playground first! The dragonlings and their besties are excited about the preparations for another Halloween holiday. 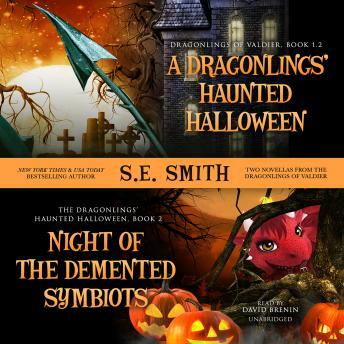 As the night of the festival draws closer, the dragonlings, Roam, and Alice discover a threat to the newest members of their families: the Queen of the Demented Symbiots plans to send her minions to capture the newest babies and take them to the land of Halloween where she lives. With their parents busy organizing the huge festival for the people of Valdier in an underground cavern, the dragonlings and their friends are left with no choice but to prepare for the ultimate battle-to save Morah, Leo, and Hope from the Queen of the Demented Symbiots. Join in a holiday adventure that you won't forget as the little ones use their special skills to protect their friends and family in Night of the Demented Symbiots.